One thing I didn’t realise when I started this blog and have started to find over the last year is that there are lovely people out in the world of booze blogging. Thanks to my rather specific focus on the world of whisky (it’s only half my posts…I do try to do other things) I’ve mainly bumped into folk from that area and one of the best known (currently number 5 on Google for Whisky Blog) are Neil and Joel of Caskstrength. I’ve been reading their blog for a while, ever since the folk at the SMWS were shocked that someone who lived on the internets as much as I wasn’t doing so already, and their informal, metaphor and pun laced prose is a breath of fresh air compared to the rather staid world of obsessively long posts that me and my ilk inhabit. 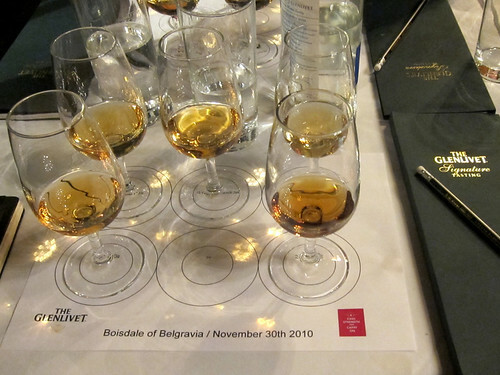 Anyways, enough flattery, they’ve already invited me to something: After meeting up with both halves of the Caskstrength gang at the SMWS new list tasting last month I was asked along to the first official tasting of their own – trying a range of whiskies from The Glenlivet with brand ambassador Phil Huckle at Boisdale. I’ve met Phil a few times before, at Chivas Regal and Aberlour tastings, due to his job as the Chivas Brothers/Pernod Ricard whisky brand ambassador in the UK, and he had got together with Neil and Joel to plan an evening exploring The Glenlivet’s range, touching on some of the less well known expressions as well as a couple of those that pop up in the supermarket. The Glenlivet is currently the second biggest whisky in the world, sitting behind Glenfiddich, and has been around for rather a long time. In 1823 there were over 200 illegal distilleries operating in the Glenlivet valley in Speyside – isolated and hilly it was the perfect location to hide from the excise men, with lookouts able to see any incoming trouble and warn the stillmen, who’d pack up and hide their stills until the officials had moved on. Illegal distilling was very much the norm, as high taxes meant that it wasn’t financially viable to distill in anything but ridiculously large quantities. However, the illegal whiskies were known for their quality, with even King George asking for a dram during his 1822 visit to Scotland, and eventually the British government relented and lowered the taxes in 1823. In 1824 George Smith, the founder of The Glenlivet, went legal, despite the danger of violence from the illegal distillers, which led to him wearing pistols at all times and arson attacks on the fledgling distillery. His spirit, however, became popular and other distillers started using the name of the valley as part of their names – there were at one point 27 different Glenlivet whiskies (including Macallan Glenlivet, Longmorn Glenlivet and Aberlour Glenlivet) and Andrew Usher, one of the fathers of whisky blending who at one point was buying the entire output of The Glenlivet, bottlled his blend as OVG – Original Vatted Glenlivet. In 1884 The Glenlivet went to court to claim the name and won, hence the obssessive use of the word The in front of every mention of the distillery so far, an affectation that I may not be as careful with from here on in. These days Glenlivet is part of the Pernod Ricard group and its whisky is no longer used in the production of their blends – the entire output, including that of the recently opened new wing, now goes to single malt production. I’ve been wary of The Glenlivet in the past, thinking of it as the dusty bottle next to the dusty bottle of Glenfiddich on the back bar of the pub, but after a bottle landed in my lap after a focus group (from a company trying to pitch for an update to the Glenlivet website) I found that I quite liked the regular 12 year old. I’ve tried a couple of the others since, but not in nice vertical tasting or with my notebook to hand, so I was quite keen to see what they had to offer. 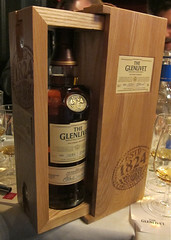 First on the list was a variation on their standard bottling – The Glenlivet 12 year old First Fill. Rather than using the usual mix of various casks this one, available only in travel retail, uses solely first fill american oak barrels for maturation. On the nose there was banana, pineapple, cinnamon and custardy apples. To taste it was lightly creamy to start, a bit of Glenlivet trademark, moving on to woody spice, honeyed apples and then a biscuity, woody end. Water enhanced the woods astringency, adding some tropical fruit (maybe mango?) as well as sweet cream. The finish was quite fruity, with a mashup of orchard fruit and wood lingering for a little bit. It’s not that different from the regular 12 year old, from my fading memory of it, but has more of the traditional american oak flavours (tropical fruit, vanilla, light spices) than I remember in the standard bottling. Next was the Nadurra Triumph. The original release of Nadurra was my first experience with Glenlivet that I remember, with a bottle being picked up in duty free on special offer, and the only thing I remember about it was that I didn’t like it. This is a special edition, using spirit that was produced solely with Triumph barley, the strain they used before switching to the current choice of Optic and Oxbridge, distilled in 1991 and bottled in 2010. Nadurra means natural and this one is bottled without chill filtering or colouring at a stronger than usual 48%. 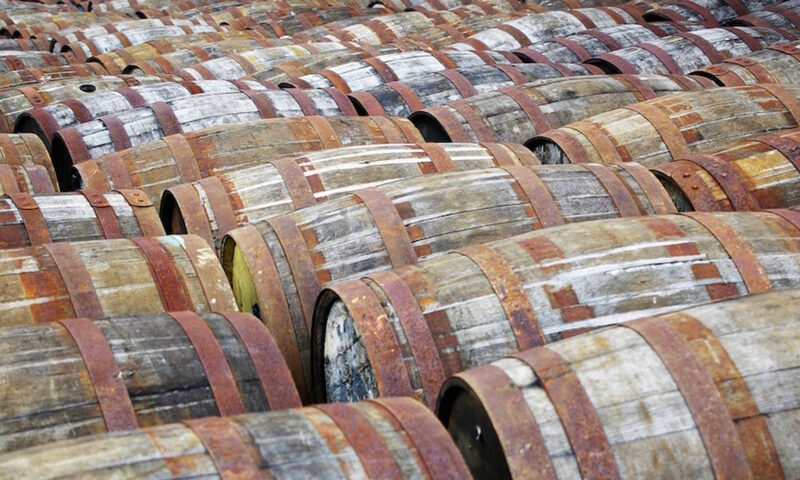 There was a mixture of wood used in the maturation, with at least some European oak complimenting the American casks. On the nose it was citrusy, with lemons, Seville orange and bitter pith, and creamy with a hint of tutti-frutti ice cream. To taste it was big and fruity, with a touch of leathery wood and little bit of banana. The assessment at our end of the table compared it to a Christmassy orange studded with cloves. Water brought out cream and bitterness, dried fruit, woody spice, nutshells and added to the heat of the finish. An interesting dram and definitely more to my taste than the regular Nadurra was when I last tried it. Fourth on the mat was The Glenlivet 18 year old. This one was noticeably darker than the other whiskies we’d drunk so far and it wasn’t much of a surprise to hear that it contains about 20% of spirit that is matured in former sherry casks. On the nose it had dark chocolate, glacé cherries, rich fruit, the expected cream and biscuits. There were also suggestions of cherry blossom and creme brulée, the latter marrying the cream, dark notes, biscuity vanilla and sugary sweetness together nicely. To taste it was thick, with lots of cream running on to sweet fruits (cherry & stewed apple) and orange peel, and then astringent wood which became dry on the finish. It didn’t take much water and didn’t change all that much, bringing out more sweet vanilla from the creaminess. This was the whisky from the regular range that I was most looking forward to tasting, as I’ve heard that I might like it. It’s got the right amount of sherry for my current taste and is also going for surprisingly low prices in Waitrose at the moment, despite being reasonably priced usually. This one might appear in the cupboard by Christmas. At this point the answer to our wondering about the empty, question marked space on the tasting mat was revealed as The Glenlivet 1824 Founder’s Reserve was rolled in. Only available from the distillery there were only 1824 bottles of this 21 year old whisky produced, commemorating the opening of the new production wing at the distillery in June this year. It was made up from 10 casks, 2 first fill sherry and 8 bourbon, and poured a deep bronze. On the nose it had cocoa powder, chocolate orange, pineapple, mango, raisins, sweet red grapes, minerally smoke and butter. To taste it had a load of spicy Christmas cake – bitter orange, walnut and figs – as well as mint and more creamy butter. A drop of water brought out more sweetness, more spice, cinnamon toffee and bananas, but I wouldn’t want to add too much. Again, this one comes in a nice box, this time with a sliding presentation section and tasteful burned in branding. Very pretty and also rather tasty, although only available at the distillery (if there’s any left). After the tasting broke up I ended up on Boisdale’s cigar terrace with a dram of their own bottling of Mortlach, famed as they are for their independent bottlings and cigar selection (the guy running the terrace that night was Victor Ferreira, 2010 UK Cigar Sommelier of the year), and had a chat with Phil Huckle about the hard life of being a whisky ambassador. Despite the heaters it was a snowy evening and what I thought to be cigar ash blowing across my field of vision turned out to be snow, sneaking around the side of the awning and pinging horizontally across the terrace – a fitting end to an interesting evening. I’ve been examining my whisky prejudices in recent times and while my dislike of Glenfiddich’s whisky still stands (and is due to not liking it rather than just not liking them for being market leaders) my opinions on Glenlivet have changed over the last year. While it’s not my favourite whisky it’s definitely one that I won’t stay away from and while I might have a bottle of the 18 year old before this year is out I suspect the occasional bottle of the 12 will also make its way through my house over the next. 12 year old Speyside single malt Scotch whisky, 40%. ~£30 from World of Whiskies for 1 litre. Travel retail only. 15 year old Speyside single malt Scotchwhisky, 40%. ~£30 from Master of Malt. 19 year old Speyside single malt Scotchwhisky, 48%. ~£50 from The Whisky Exchange. 18 year old Speyside single malt Scotch whisky, 43%. ~£35 from Master of Malt (although it’s about £30 in Waitrose for Christmas). 25 year old Speyside single malt Scotch whisky, 43%. ~£175 from Master of Malt.